I have become such huge millets fan and other than making cooking millet in normal rice form, I try new things once a while and some time back I tried this kara pongal with thinai and it's just yum. After that I made also pongal with samai (little millet) using same method and love it too. 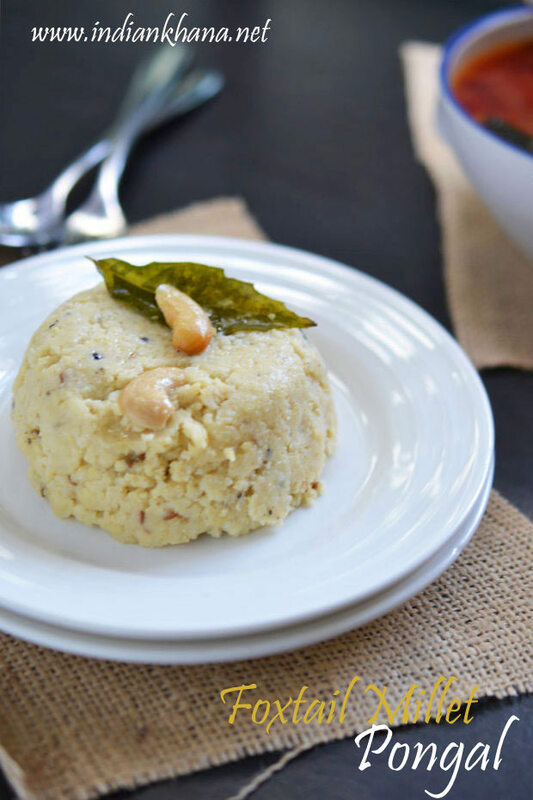 So you can try this pongal recipe with any millet of your choice. Like regular pongal this thinai pongal it's better if we eat it hot, if the pongal gets dry then add some hot water and mix well. 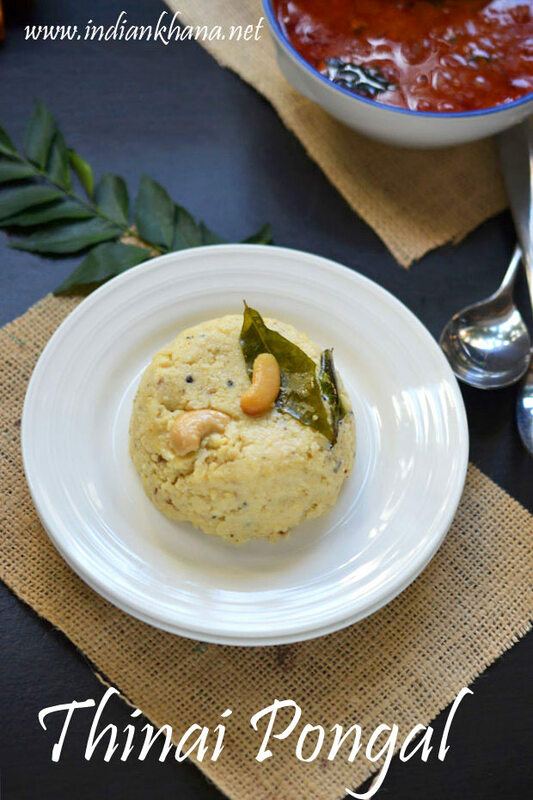 You can serve this pongal with any chutney of choice or even sambar, thinai pongal is really delicious and very easy to prepare makes great breakfast or dinner. 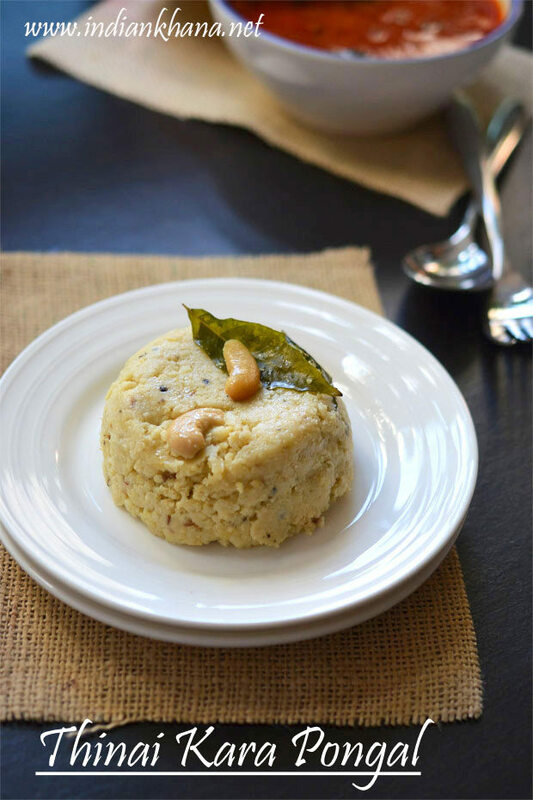 Popular South Indian breakfast pongal with foxtail millet. Wash and soak thinai (millet) and moong dal for 10 mins, meanwhile grind ginger, cumin seeds and pepper corn to coarse powder, just run mixer for less than 10 secs to get coarse mixture. Heat a pressure cook add moong dal and saute for minute in medium flame, add thinai (foxtail millet) and saute for a minute too. Add whole peppercorns (I added crushed peppercorns), salt, water mix well and pressure cook 4 whistles in medium flame. Once pongal gets cooked and while we wait for cooker to release pressure, in a small tadka pan or normal pan heat oil or ghee, add asafoetida, curry leaves, ginger-cumin-pepper mixture we prepared and saute until they start to become brown. Now add cashew and saute until cashew gets golden brown. 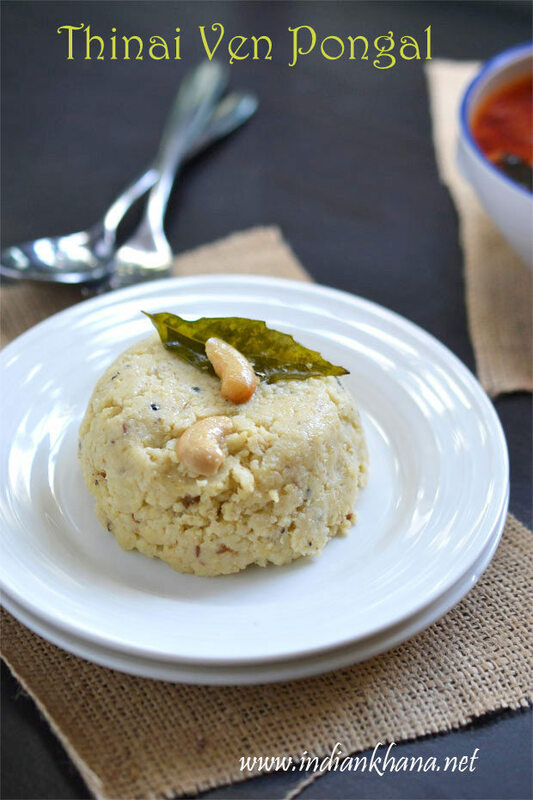 Open cook and mash well pongal, pour this tempering over pongal and mix well. Serve hot with chutney, sambar. I served with beetroot sambar. You can add 1/4 tsp of turmeric powder too. If pongal becomes dry after a while add 1/2 cup of hot water and mix well. 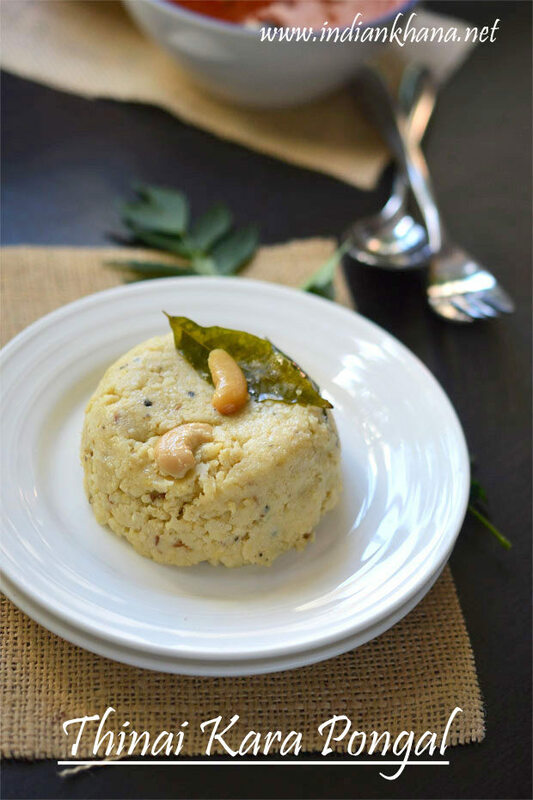 Simple, delicious, gluten-free, vegan thinai ven pongal.